You’ve waited all year for your plum tree to bear fruit. But when it comes harvest time, the plums have all been consumed by local birds. Birds are very resourceful and few devices will keep them away for very long. To be successful, you will need an arsenal of devices and tactics that are ready to be deployed the minute one stops working. Monitor your trees to see when bird numbers seem to increase and when fruit starts being damaged. Monitoring will help you know when it’s time to take action. Keep a record so you can act early in upcoming years. Combine noisemaking devices and visual repellents for the best results. These devices only need to be used during the day -- because birds that damage fruit are not active at night. Change or move the devices at least once a week to keep birds from becoming accustomed to them. Use noisemakers like bird bombs, shell crackers, gas cannons and recorded bird distress calls at irregular intervals. Elevate the noisemakers above the tree canopy, and move them around frequently so they will have the most effect. You will need at least one device for every 5 acres. Noisemakers are less effective for crows, scrub jays and magpies. Tie reflective material like pieces of reflective mylar tape, pinwheels, strips of foil, aluminum pans or CDs to the branches. Strips should be at least 18 inches from the ground and be spaced about 5 to 10 feet apart. Hang them so they move in the breeze and reflect the sunlight. Place a pole near the center of the tree that extends 2 feet above the top. Tie lengths of monofilament fishing line to the pole and stake them around the tree about 2 feet apart (like a teepee). This method works best for sparrows, but does not work as well for robins and starlings. Hang 1/4- to 1/2-inch plastic or nylon mesh netting over the pine trees. Special frames can be used that holds the netting away from the tree to keep birds from accessing plums on the edges. Netting is the most effective way to prevent birds from stealing your plums, according to the University of California Integrated Pest Management Program. Spray chemical repellents like methyl anthranilate or methiocarb (Mesurol) on the fruit. They can be effective at reducing fruit damage, but won’t prevent it. 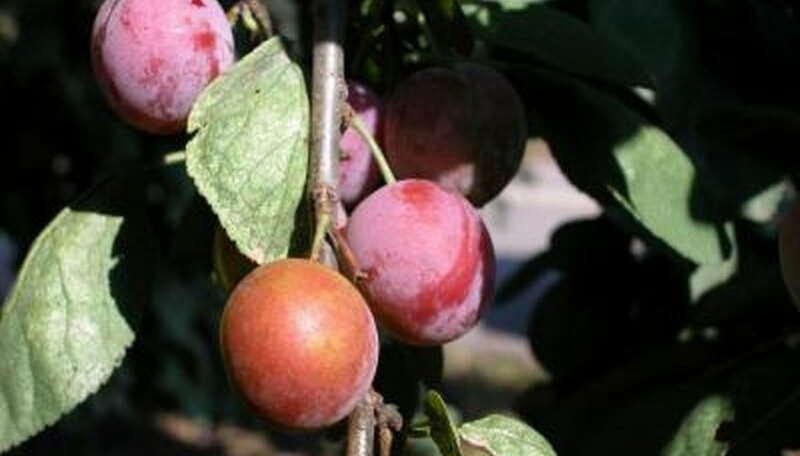 Check with your local county extension office before using to see if they are approved for usage on plums in your state, since approved usage of the chemicals sometimes changes. Install nest boxes or platforms to attract hawks or owls. Birds won’t want to eat when a natural predator is around. Check with your county extension office on what birds are in your area, and the install a nesting box or platform that will attract them. Scatter alternative, cheaper foods like cracked corn to decoy birds away from your plum trees, suggests Robert Pierce an Extension Wildlife specialist with the University of Missouri. Penn State College of Agricultural Sciences; Controlling Birds on…; Margaret Brittingham, et al. Iowa State University Extension; Problem Birds around Homes and Farmsteads; Georgia Bryan, et al. Kansas State University; Birds: Urban Wildlife Damage Control; Charles Lee, et al.